For me, following up that Killebrew card has been some hard work. The Killer card came out awesome. I think sky blue background nearly matches the card color, so every card I’ve made since seems to pale in comparison (I have a backlog already!). Will this deter me from making more missing HOFer Topps cards? I didn’t think so. The Killer card has also seemed to spark a friendly rivalry in the card-o-sphere. Check out White Sox Cards post, and see some of his past “cards that never were” work. Awesome. 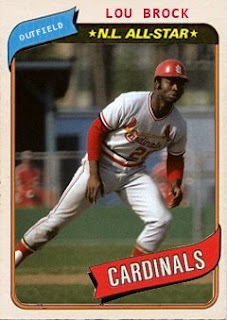 Up next is an attempt at Lou Brock’s final 1979 season, which gives birth to a 1980’s Topps. After doing some research on Lou’s last hurrah, I cannot understand why Topps left him out of the 1980’s set. Lou’s last season was on par with his previous 18 seasons, and it ranks as one of the best final seasons of a HOFer. Unlike Aaron and Killer who had subpar batting averages in their last year, Brock shined through with a .304 average, which was 11 points higher than his career average! Heck, Lou was even selected for the All-Star game, which makes his presence that much more missed from the 1980 set. As far as the cards, the 1980 template is a real pain. The banner flag is difficult to cut around, and I still am having trouble getting the exact font types. If anyone has suggestions for font sizes and types, let me know and I can update the cards. I’m baffled at his absence from this set. PS - If you've got a request for a HOFer's missing last Topps Card, let me know in the comment box, and I'll give it a shot. 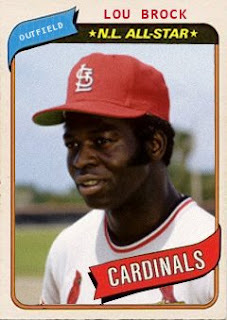 OK, I know it's Lou Brock who brings out this question I have, but... Why doesn't/didn't Topps list how many SB a player had? I believe Phil Niekro and Steve Carlton definitely deserved 1988 Topps cards; both started over 20 games and though their ERA's and W-L's weren't stellar I would've loved to have one last card of them.